Created with breathable, four-way stretch mesh, the Core Supporter achieves the perfect fit. The comfort waistband allows you to play without irritation. The Shock Doctor's BioFlex Cup, a vented bio-shape cup designed to shield areas where protection is most crucial. The body of this core protective cup forms flawlessly to your athletic frame to provide unrestricted movement, airflow and comfort. Created with breathable, four-way stretch mesh, the Core Supporter achieves the perfect fit. The comfort waistband allows you to play without irritation. 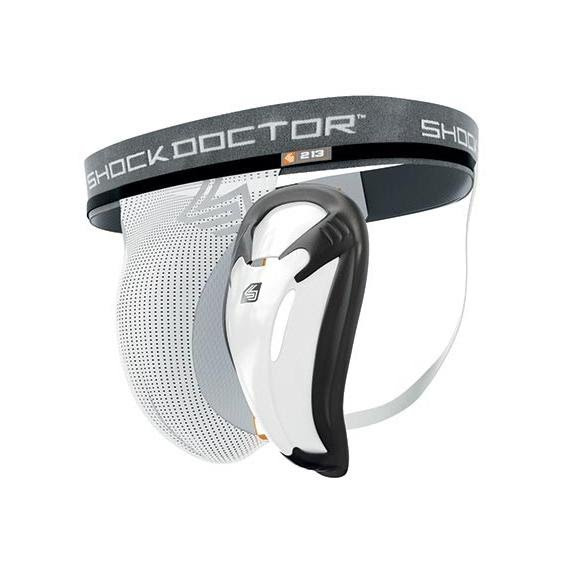 The Shock Doctor&apos;s BioFlex Cup, a vented bio-shape cup designed to shield areas where protection is most crucial. The body of this core protective cup forms flawlessly to your athletic frame to provide unrestricted movement, airflow and comfort. Unique, vented bio-shape body with integrated gel perimeter pad for unrestricted movement and improve comfort. Measurements Sizing: Waist- Small 26–30", Medium 30–34", Large 34–37"